Jenni is the glue that holds all things @Homes together, wearing whatever hat is needed at that moment for both clients and agents. As a client coordinator, she is often the first voice many clients hear as she advises them during the first steps of their buying/selling journey. When @ Homes Realty Group hosts client or agent appreciation events, Jenni is the coordinator, making everything run smoothly from start to finish. 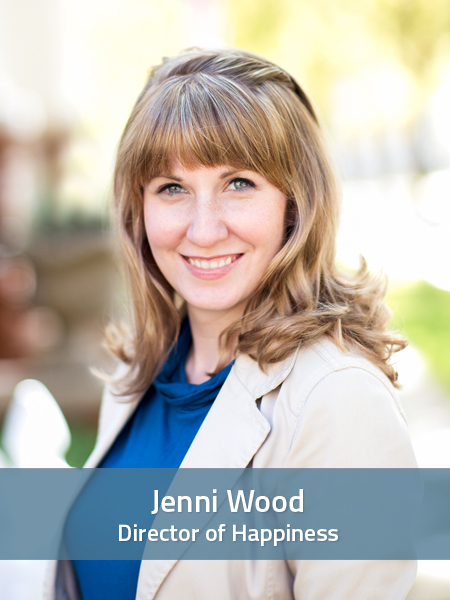 And if those two things don’t keep her busy enough, Jenni also handles closing and listing needs for clients and agents, as well as providing in-house agent training whenever there are new tools available for @ Homes agents to improve their efficacy. There is little doubt, that without our Director of Happiness we would be a sad dysfunctional group indeed! I love the opportunity I have to participate in connecting a person with the best possible real estate experience. So many times I pick up the phone and think, “I’m SO GLAD you called us!” and I MEAN IT. I like all of the things Realtors aren’t supposed to like – contracts, data, negotiations, surprises… I love dealing with the unexpected AND turning it into a positive for someone else. In your opinion, what is the ONE most important quality a client should look for in a Realtor? Honesty. Anyone can tell you what you want to hear. A realtor that tells you what you NEED to hear is someone who is looking out for YOUR interests, not their own. What are the most popular amenities buyers are currently seeking in a home? Right now I feel like buyers are wanting all of the amenities (granite counters, hardwood floors, tile in bath, media stations) that they’re seeing in new construction, but they’re rejecting the cookie cutter feel of those planned subdivisions. I think this could provide a unique opportunity to those in older homes if they’re willing and able to do some updates. We have a GREAT arts community here, go see a play, take in a concert, go to an art exhibit – you’ll be amazed at the talent we have locally!